With sky high prices at concession stands, and a fashion sense that&apos;s crystalized into a sort of uniform, there&apos;s much to be said about how Coachella has jumped the shark. Still, there&apos;s no denying that the festival (which has been around since 1999!) knows how to wield its clout and put on a blockbuster. This is perhaps best exemplified by how organizers shrugged off the news that Beyonce had to drop out of Coachella 2017—a few phone calls were made and suddenly Lady Gaga was there in her place. Two people who are totally over Coachella? Tyler Joseph and Josh Dun, apparently. 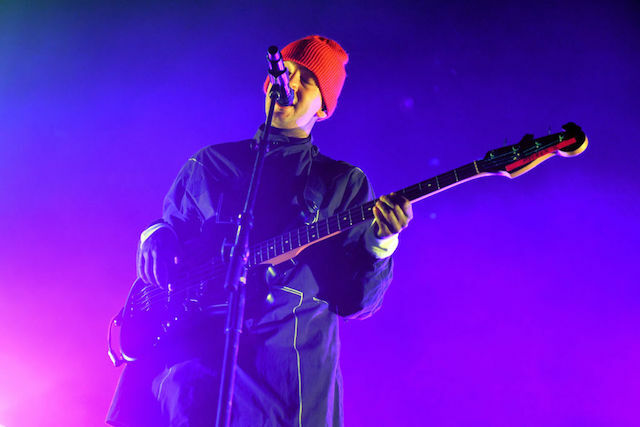 Joseph (vocals) and Dun (percussion) are the two regular members of the Grammy-winning Twenty One Pilots, who are kind of like Everlast 2.0, what with their sporadic rapping and darkly messianic choruses. At day two (Friday) of this year&apos;s Firefly Music Festival in Dover, Delaware, the band unloaded some major Coachella hate in front of a large crowd. As reported at Billboard, it started before the band had even played a single song. A giant screen on-stage was splashed with a video depicting a Godzilla-like behemoth attacking Coachella. Later, a text spelling "Coachella"—designed to resemble the Hollywood Sign—is blown to smithereens. The band then launches into a couple songs before Joseph takes the mic and makes explicit (as if it wasn&apos;t explicit enough already) the band&apos;s disdain for Coachella. "It&apos;s not that we don&apos;t like Coachella. It&apos;s just that we can&apos;t stand it," said Joseph. "When I hear about that festival, I always tell them, have you ever been to Firefly though? We would take you guys every single day." The subtext here was that Coachella is now a "scene," while Firefly is more About The Music. And the explosion of the Coachella/Hollywood Sign can be taken as an attack on, I guess, the superficiality of the festival/L.A. While we don&apos;t disagree with the argument that Coachella is a scene, we&apos;d like to point out that Firefly is part produced by Goldenvoice, the Anschutz Entertainment Group company that also produces Coachella. So, yeah, there&apos;s that. How was the rest of the show? There was a cover of Chumbawamba&apos;s "Tubthumping" and House Of Pain&apos;s "Jump Around" (didn&apos;t we mention an Everlast connection?). The crowd was also treated to the band&apos;s particular brand of rock, hip-hip, pop, folk, and reggae—a true cornucopia of aural samplings. You can catch the Coachella-hate in the video below; Joseph&apos;s comments on the festival start at the 9:10 mark.